A simple dish that works wonders for breakfast, lunch or dinner? Ham hash with fried eggs is the answer, with eggs just as you like them: over easy, sunny side up, scrambled or hard boiled. 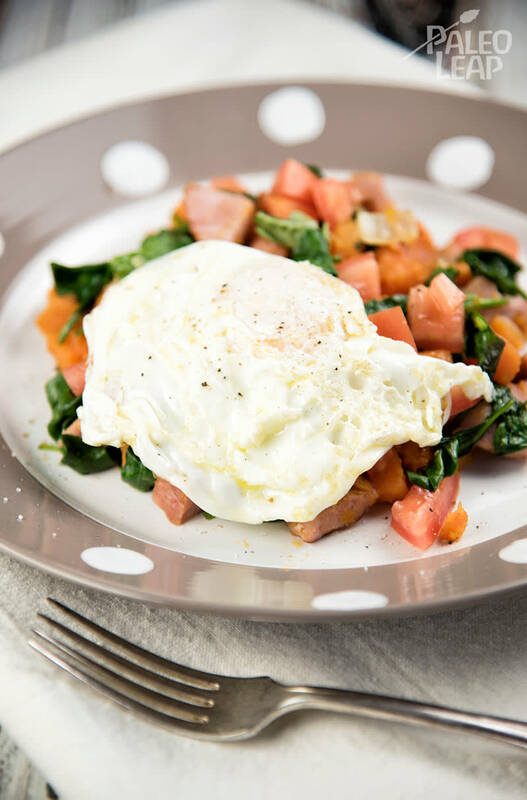 Of course, you’ll find all sorts of casserole recipes for a ham hash with sweet potatoes, and we love those too, though on occasion we just prefer our trusty skillet – it is the true Paleo tool. A skillet should hold a special place in your kitchen as it embodies a whole range of amazing dishes from Keto tacos to fried honey bananas. What’s that if not versatility in cooking? Now, at some point you may question the consumption of sweet potatoes on your Paleo journey. Paleo is not a low carb lifestyle, and sweet potatoes are on the top as the most common Paleo starch. Sweet potatoes are abundant in Vitamins A and C, antioxidants, and they also contain elevated levels of manganese and B6. They are super versatile and can be added to sweet or savory dishes. If you’r going for a lower carb count, try switching them out for some cauliflower or summer squash. So, go ahead and get your sweet potato and ham hash on! Just remember the fresh spinach and basil leaves, it’s always a wonderful sight to have green on the plate. In a large skillet over medium-high heat, melt 2 tablespoons of butter with the olive oil. Add the sweet potatoes to the skillet and season with salt, pepper, thyme and chili pepper. Cook until the potatoes are tender, and slightly golden brown on the outside. Add the onions and the ham to the skillet. Cook for about 4 minutes. In a separate skillet over medium-high heat, melt the rest of the butter. Fry the eggs in the pan and season with salt and pepper as desired. Add the spinach and basil to the potatoes. Cook until the spinach begins to wilt, but only for a few minutes. Remove from heat. Finish the hash by adding the chopped tomatoes. Serve eggs atop the hash.